How much longer can this half-trillion dollar company continue to find ways to boost its bottom line earnings? Apple (NASDAQ:AAPL) reports earnings on July 22, after market close. As usual, the event will be closely watched. While there will be a number of hot metrics to watch, one will tell the story of Apple stock better than any other: earnings growth. With arguably Apple's greatest challenge being its size, investors want to know whether or not the tech giant can still grow its business meaningfully. Rendering of the planned Apple Campus 2. The main building has 2.8 million square feet with room for 13,000 employees. Image source: Apple. This is a question investors have been asking for a long time regarding Apple stock. As the world's most valuable publicly traded company, with a market capitalization that exceeds half a trillion dollars, the saying "what goes up must come down" plagues the stock. In fact, it's this simple notion that is arguably behind Apple's conservative price-to-earnings ratio of 16, trailing behind the S&P 500's ratio of 19.4. Some investors may have thought they were witnessing the top for Apple when its year-over-year revenue growth hit zero in the third quarter of 2013. The market was insanely bearish on the stock, with shares trading below a post-split $60 per share. But since then, Apple investors have become increasingly confident that the company can continue to grow its business. While Apple's year-over-year revenue growth rates have improved, its earnings-per-share growth has improved even more. The improving earnings story has reinvigorated market interest in the stock. Shares have soared 60% in the past year. Consider Apple's most recent quarter. Apple's EPS grew by 15%, year over year. The growth stemmed from slight revenue growth, an aggressive share repurchase program, and favorable gross profit margin comps. This rate was the highest the company has reported in the last six quarters. Will the growth continue in Q3? That's the question investors will be looking to find out. While the consensus analyst estimate for Apple's earnings in Q3 is for 14% growth, last quarter Apple easily beat estimates, reporting EPS of a post-split $1.66 compared to estimates for $1.46. Upside surprise in Q3 is a possibility, too. Especially considering longtime Apple analyst Katy Huberty's projection for Q3 iPhone sales to come in 25% higher than the year-ago quarter. This, combined with the effects of share repurchases, could help Apple easily exceed last quarter's EPS growth of 15%. While iPhone sales can't grow forever, Apple can continue to buy shares as long as it maintains its pricing power. And, fortunately for Apple investors, its pricing power isn't showing any signs of slipping. 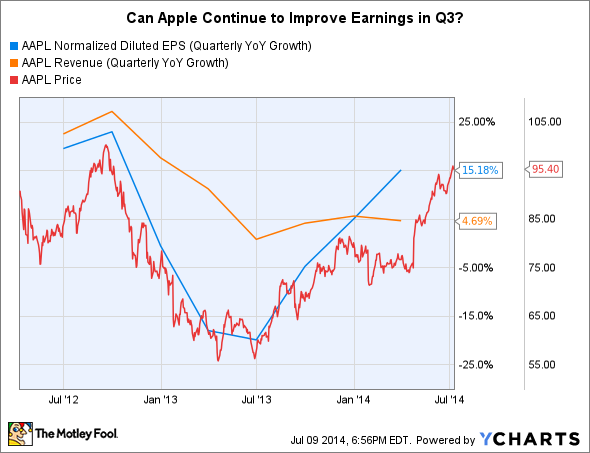 Can Apple continue to grow EPS at meaningful levels for the long haul after all?